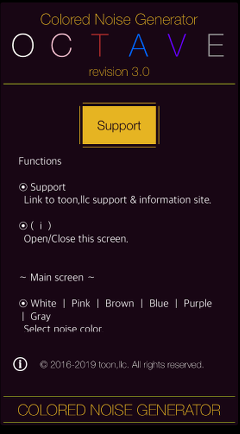 toon|Colored Noise Generator Support - toon,llc. ”Colored Noise Generator" is a new noise generator that can be used to as the sound source for a variety of acoustic measurement and auditory effects. 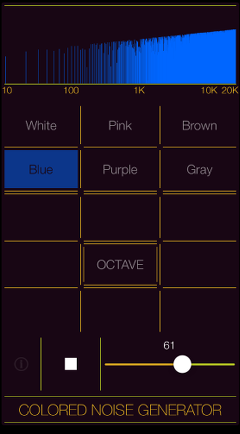 This app can generate standard noise signals such as white noise, pink noise, brown noise, blue noise, purple noise and gray noise. In addition, it can generate a specific octave band noise signal by using the band-pass filtering of 1/1 octave band with ideal steep attenuation characteristics. Octave band noise can be used for various purposes as a reference sound source for environmental sound measurement, sound tuning, tinnitus relief and sound masking. Octave band noise can be created as a multi-band coupling signal by 1/1 octave band filter with a center frequency from 63Hz to 8kHz. As other applications, Octave band noise is also useful to adjust the characteristics of the audibility of earphones or headphones. For example, by selecting the pink noise and playing the 1/1 octave band noise in the order of 125Hz, 1KHz, 8kHz of the center frequency, you can determine the intensity of each frequency band on the audibility. 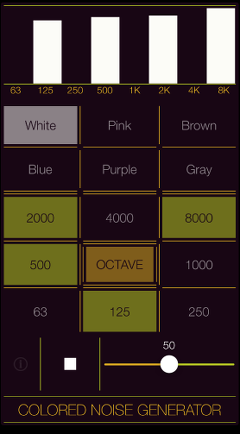 For more detail analyzing, please try in other octave bands or 1/3 octave band noise by using "Octave Band Generator" app. If you know the characteristic of frequency band, you will be able to adjust the earphone in the equalizer to your favorite sound easily. 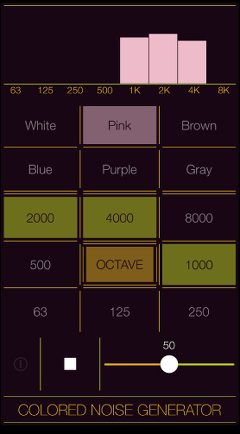 Please to click the following link to download "Colored Noise Generator" from App StoreTM. It will be open the download page on App StoreTM. Communications charges when connecting to the App Store will be borne by the customer. iPhone, AirPlay is a trademark of Apple Inc., registered in the U.S. and other countries. App Store is a service mark of Apple Inc. Recommendation : Requires iOS 12.1 or later. 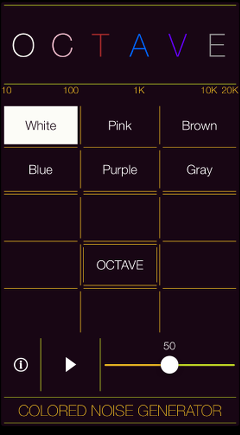 1/1 Octave band noise : 8 types, center frequency - 63Hz, 125Hz, 250Hz, 500Hz, 1kHz, 2kHz, 4kHz, 8kHz. Octave band noise can be selected multiple bands simultaneously. So this combined signal contains the frequency components of the multi-band. Frequency range : 20Hz - 20kHz. Signal output time : 40 sec. For processes of testing and equalizing rooms and auditoriums, it is convenient to have broadband noise signals. Typically, white noise or pink noise is used. In addition, there are colored noise such as Brown Noise, Blue Noise, Purple Noise, Gray Noise. In order to further measure in detail, Octave band noise will be able to take advantage of the testing noise signal that some part of the 1/1 octave band is divided. "Colored Noise Generator" can generate a programable frequency band-pass filtering signal by source sound of White noise or Pink noise or Brown noise. 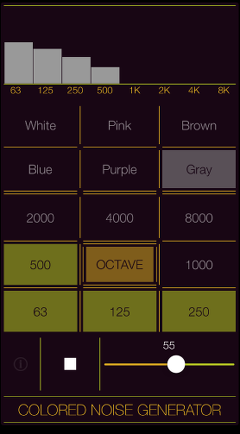 You can select any octave band and output a noise signal through the octave bandpass filter. In addition, by disabling the octave band-pass filter, it is possible to output a broadband noise signal. Octave band-pass filter : 1/1 octave-band, No-filter (wideband noise) can be selected. 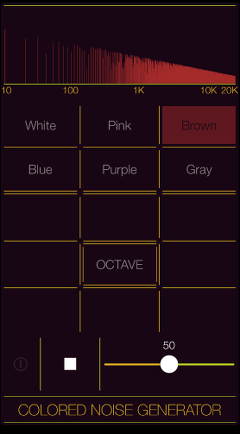 (1) Noise signal source selection : Tap a noise button to select the base noise signal. The default at initial startup is white noise. 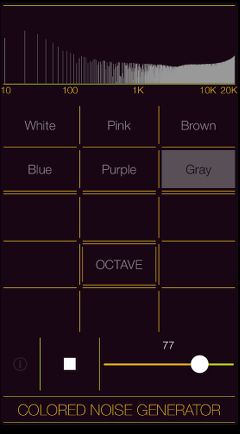 (2) Selection of bandpass filter : Tap "Octave" button and select the octave band filter. The default on initial start is No-filter. 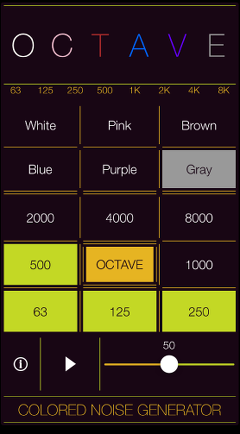 (3) Octave band selection : When "Octave" is selected, you can tap the frequency band (center frequency) button to select that you want to output. 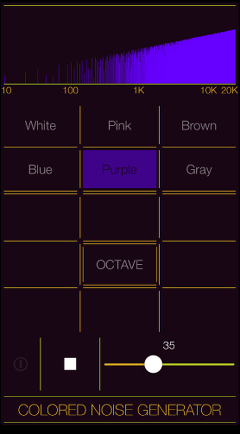 (4) Start/Stop : When you tap "Start" button, noise signal output starts and the frequency spectrum is displayed. Tap "Stop" button to stop output. Also, it stops automatically by the timer. White noise is noise whose amplitude is constant throughout the audible frequency range. Twice the power corresponds to a 3 decibel increase, so white noise is said to increase 3 dB per octave in power. By disabling the octave band-pass filter, it is possible to output a broadband White noise signal. 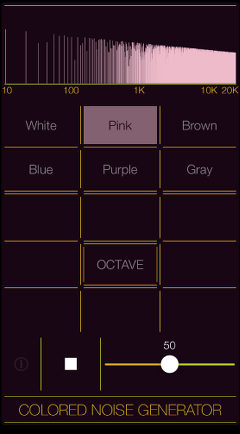 Pink noise is filtered to give equal power per octave or equal power per 1/3 octave. The power of pink noise per Hz of bandwidth decreases by 3 decibels per octave. When pink noise is chosen for equalizing auditoriums, the real-time analyzer can be set up so that they display a straight horizontal line when they receive pink noise. By disabling the octave band-pass filter, it is possible to output a broadband Pink noise signal. The power spectral density is a noise signal that drops by 6 dB per octave as the frequency rises. For audio applications, this is also used for subwoofer phase checking and aging of mid-low range speaker units. For healthcare applications, this is also used for relaxation treatment of sleeping disorders, sound masking for environmental noise and tinnitus. By disabling the octave band-pass filter, it is possible to output a broadband Brown noise signal. Power spectral density is a noise signal rising by 3 dB per octave as frequency goes up. By disabling the octave band-pass filter, it is possible to output a broadband Blue noise signal. Power spectral density is a noise signal that increases by 6 dB per octave as the frequency rises. By disabling the octave band-pass filter, it is possible to output a broadband Purple noise signal. It is a noise signal that shows a power spectrum close to an equal loudness curve like psychoacoustics. By disabling the octave band-pass filter, it is possible to output a broadband Gray noise signal. Octave band noise is generated the multiple frequency divided band signal by using the band-pass filtering of 1/N (N is a natural number) octave band. 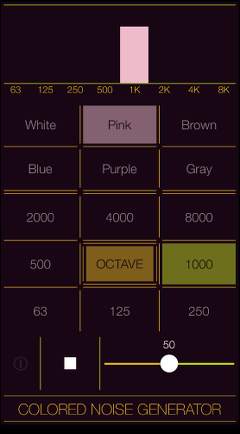 It can be used in order to measure and evaluate the sound level of a certain frequency band on the basis of the octave. This signal contains all the characteristics of the source signal in the split frequency band. The 1/1 octave band noise can be created as a multi-band coupling signal by 1/1 octave band filter with a center frequency from 63Hz to 8kHz. 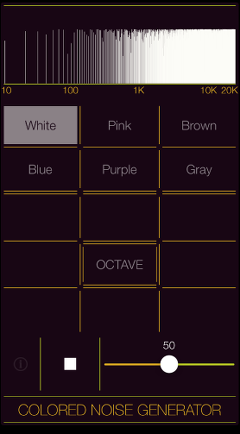 You can select any octave band and generate the specific noise signal. By tapping "i" button, it is displayed the product information. If you tap the "Support", Safari starts and you can see our support page. * Improved stability. Newly supported Buletooth communication and continuous playback. * Changed App name. Changed UI design. Added Brown noise, Blue noise, Purple noise and Gray noise. Please be careful that continuous high-volume and high-frequency signals can damage speakers, even if your ears don't perceive them as being too loud. When using this application with wireless communication such as Bluetooth or AirPlay, there may be cases that limitation of the playback frequency, lowering the output level and irregular noise, etc., may occur under the influence of wireless environment, communication equipment and communication state. Please note that this is not to guarantee that this application operates as configured specifications under the wireless communication. AirPlay data transmission is a wireless communication system using Apple's proprietary audio data compression. For this, there are cases where the random sound noise is generated by radio condition and the compatibility of AirPlay connection equipments. Note that it may occur at particularly high frequency band. The octave band-pass filters are compliant with "IEC 61260:1995" and "JIS C 1514:2002". Please send a review of your comments and requests for this app. We will use your review to improve our products. Thank you for your cooperation. Please send a review message for "Colored Noise Generator". Please fill in your review by accessing from iOS device. Inquire about this app please from below! Please contact us with the following details if you have any requests or problems. 5. Details about your requests or problems.